The public park has been compared to NYC’s High Line. Jun. 15, 2018, 11:00 a.m.
After many years of discussion, planning and renovation, Phase 1 of the Rail Park opened to the public on June 14. Running a linear 1,400 feet from Broad and Noble streets to Callowhill between 11th and 12th streets, the project is a proof-of-concept for the reuse of the entire stretch of elevated rail line. Originally commissioned in the 1890s, the Reading Railroad Viaduct brought both freight and passenger trains into Center City. It had sat unused since the 1980s. After a 2010 study determined that renovations would be less expensive than demolition, the Rail Park project kicked off. Community forums were held to hear concerns about how to make sure the park would benefit neighborhood residents. Ground was broken for the first phase in 2016, followed by a $10.8 million construction project that included 19 months of removing contaminated soil, building new railings and stairways and planting greenery. Leased by the Center City District during the renovations, the Rail Park is now owned by the City of Philadelphia. 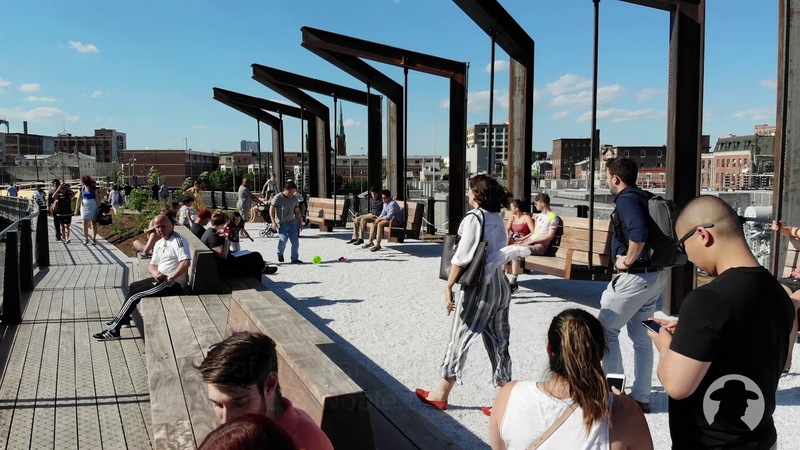 It will be managed jointly by the CCD, Philadelphia Parks and Recreation and the Friends of the Rail Park, the group of volunteers who pushed the project through to fruition. Check it all out in our drone video overview of the Rail Park, Phase 1. Correction: A previous version of this article indicated the Reading Viaduct rail lines were in use through the 1990s. Per the Center City District, use ceased in 1984.